Looking for a career rather than a job? Founded in 1924, Rocky Mountain Air Solutions built its business on the belief that excellent service should be the expectation, not the exception. If you believe in hard work, attention to what matters for the customer, and pouring yourself into the task at hand, RMA will give your focus and dedication a place to thrive. More than that, we believe in creating a career that you can be proud of. This is not a sit-behind-your-desk-all-day kind of company, and we believe you should roll up your sleeves and get your hands dirty. Literally. As a company, we demand a lot from our employees because we believe they are capable and competent. 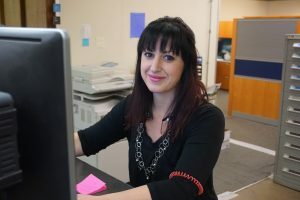 Internally, we champion the message that we are Kind, Competent, and Professional in everything we do, whether that is interacting with our customers, our vendors, or each other. It is our belief that we are all here to be better at what we do, that thoughtfulness matters, and that leadership begins with speaking up. Learn through our hands-on approach to training, ask questions, and challenge our practices. We believe in offering great opportunity to those who reach for it, and we believe that our employees should drive their own career, and therefore the company, forward. Apply to be a part of our future today! Diligent… Driven… Demanding… these are just some of the words that we use to define ourselves. We are a driven company that aims at being better tomorrow than we were today. We begin with driving our operations through processes, limiting our errors and ensuring that we can keep our focus on what matters most: our customer. As a business, we have a choice on what to focus our collective efforts on improving. Our choice is continually on our service. We set high expectations for competence, professionalism, and kindness in every transaction. We look for people who are willing to dive in and lead our future. This company aims to be something great – are you ready? We offer all the standard benefits like medical and dental insurance, Long-term Disability and Life insurance, 401K, paid holidays, paid vacation and sick time. Perhaps you are a college educated and experienced professional who is looking for a career change. We put your education to use by serving our customers with flawless dependability. We will challenge your brain. We are not a call center. We do not sit all day. In fact, we are physically demanding. We believe in making constant improvements – we work hard to improve ourselves, each other, and our craft. We believe in recruiting talented individuals at every opportunity. We work hard to be proactive, not reactive. We believe in competence, a stick-to-it attitude, and tying together all the details that make the lives of our customers a little bit easier. We are, as Jim Collins says, “productively neurotic, self-motivated and self-disciplined”. We aim to be the best in our industry in operations and meeting customer needs. Simple, right? Only this is difficult to find in service businesses today. We worry about the customer first, so if you think we will coddle you, think again. However, we will train you to our expectations. Please apply with a resume and cover letter explaining why Rocky Mountain Air Solutions and your location of interest. Here is what we want…what everyone else wants…professional, safe and responsible drivers. Consider working for us because our drivers are more intellectually stimulated on the job. We attract and are attracted to smart drivers. You will drive and can expect to be out and about the truck during delivery – your expertise is genuinely different than most drivers. We are not for everyone. We demand high performance and safe practices because we work for you as you work for the customer. We mean to be the best in our industry. We mean it. We do not coddle. We hold each other accountable. We do what we say and say what we do. We reward your work with competitive pay, a financially secure company, a safe vehicle and good benefits. We dedicate ourselves to excellence in all we do. What about you? Physical Demands: As a driver for RMA you will be responsible for moving cylinders by rolling them to carts for loading and unloading at the customer location. Expect to complete this task as well as easily lift 60 pound boxes of wire. Job Requirements: City Delivery Drivers must have a current CDL Class B license with a Hazmat Endorsement and training in air brakes. MUST HAVE A CLEAN MVR – please no DUIs/DWIs. We require a background check, a pre-employment assessment and a drug test along with current DOT required documentation. A high school diploma is required although we prefer college credit. No GED’s will be accepted. Located in Salt Lake City, UT, RMA is looking for a Cylinder Maintenance Technician who is focused, detailed oriented, and self-motivated. 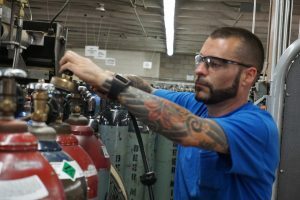 The successful candidate will go through a training program that includes learning to examine, test, and maintain compressed gas cylinders including cylinders used in beverage, food, scuba, paintball, aviation and fire extinguishers. Upon completion of training, the candidate will be begin the safe testing and maintaining of compressed gas cylinders which may also include delivery of the cylinders. This position can lead to a supervisory level position if our criteria are met. Opportunities for continued advancement throughout our organization are available for those who show outstanding progress. We require the individual to be detail oriented and to be able to follow written and verbal instructions. The candidate will test and repair cylinders and may load and unload trucks. Accuracy and precision in following procedures and regulatory processes is mandatory. Any candidate for this position must be in good physical condition as the demands of the job are physical in nature. Job Requirements: To be successful in this job, you must be in strong physical condition, as the demands of the job are physical in nature. We classify this as being able to lift up to 60lbs on occasion. You must also have your high school diploma. Please note that we do not accept GED’s unless you have successfully completed some college coursework. And finally, prior gas handling experience or testing is helpful, but not required. We offer a full benefits package, including competitive pay, medical, dental, life and disability insurance, 401K, vacation, holiday, and paid sick days. No phone calls or on-site visits will be permitted. You will not be hired if there is a phone call or on-site visit. Here is what we want…what everyone else wants…professional, safe and responsible drivers. Consider us because our drivers are more intellectually stimulated on the job. We attract and are attracted to smart drivers. Because we train you to the delivery of cryogenic liquids you deal with science, mechanics and customers directly. You are also personally acquainted with the branch personnel, your home location AND your family. Coworkers know who you are and what you provide for the company. When we say you are part of a team you actually will get to know your team from the owners, customer service, plant personnel and the cryogenic technicians. We pay as competitively as the road warrior guys but our demands are different. You will drive but you will also NOT stay in the truck. You will be out and about during delivery and your expertise is rare in the work. You will proudly tell your kids you are the reason that the hospitals have oxygen and you can tell your friends you are a critical component in beer brewing. You can tell you mom you work hard, are respected and well paid and you can tell your spouse you will be home for dinner more often. If these job attributes are important to you then make yourself important to us. We are not for everyone and it takes us a while: an assessment and an interview to see if we can see in you what we need to grow our future. You will be able to take a hard look at us as well. We will disclose whatever you need to know to evaluate us. We are careful not to bring in the run of the mill driver. You know who we are talking about, right? We don’t even glance at average. We demand high performance and safe practices because we work for you as you work for the customer. We mean to be the best in our industry. We mean it. We do not coddle. We hold each other accountable. We do what we say and say what we do. We reward your work with competitive pay, a financially secure company, a safe vehicle, and good benefits. We dedicate ourselves to excellence in all we do. What about you? Located in both Denver, CO or Salt Lake City, UT, the ideal candidate for a Cylinder Gas Filler will be focused, energetic, detailed oriented, and self-motivated. 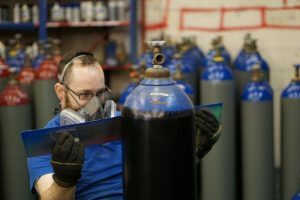 The successful candidate will go through a comprehensive training program that includes learning to fill compressed gas cylinders. Upon completion of training, the candidate will be proficient in the filling of compressed gases and may be able to direct the loading / unloading of trucks. This position can lead to a supervisory level position if our criteria are met. Opportunities for continued advancement throughout our organization are available for those who show outstanding progress. The Cylinder Gas Filler position requires the individual to have a high energy level, be detail oriented, and be able to follow written and verbal instructions. The candidate will load and unload trucks as well as fill cylinders with compressed gases. Accuracy and precision in following procedures and regulatory processes is mandatory. Any candidate for this position must be in strong physical condition as the demands of the job are extremely physical in nature. 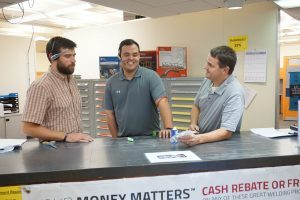 We currently have a variety of openings available including Customer Service Store and Branch Management in our Salt Lake City/Orem, Colorado Springs, and Denver areas, Transportation, Safety, Regulatory Compliance, highly skilled roles in our plants, and more. If you are interested in working for this company and do not see the specific role you are interested in available, please submit your resume with a short note explaining what you are interested in below and someone will be in touch with you shortly.